This frozen margarita begins as a cool, crisp cocktail, but there is a secret and it comes from the brand that shared it. 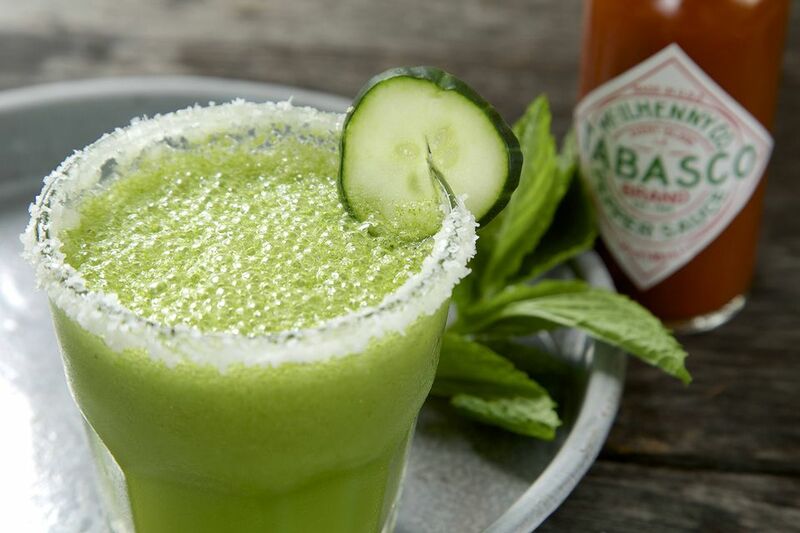 The recipe is from Tabasco, that essential hot sauce that no bar or kitchen should be without and it adds a fantastic contrast to the cool taste of fresh mint and cucumber. The Cucumber Mint Margarita is very easy. Simply gather all of your ingredients, toss them in the blender, and start it up. I enjoy the suggestion of a reposado tequila here because that bit of barrel flavor from the aging adds a nice dimension that a blanco cannot. Though I would not rule out a quality blanco either, the reposado simply adds a bit of depth. As with any spicy cocktail, start slow on the hot sauce and add more to suit your taste. This is really easy with blended cocktails because you can use a spoon to taste test it before pouring and any adjustment will just require another whirl of the blender. You can always add heat, but you cannot take it away. If you prefer, skip the salt rim or rim only half of each glass so you can switch back and forth. As always, if you find that the 6 recommended ice cubes leaves the mix too thin, add a few more cubes and blend again until you have your ideal consistency. Blend ingredients in a blender for one minute. Divide between two 6-ounce salt-rimmed glasses. Garnish each glass with a cucumber slice. Fernet-Branca and Tequila Together In a Cocktail? Trust Us, It Works! Creating great tasting cocktails at home is easy once you have some recipes. Get our free book when you sign up for our newsletter.